The Cleveland Movie Blog: Cleveland Cinemas and the Cleveland Museum of Natural History Partner for "Backcountry"
Cleveland Cinemas and the Cleveland Museum of Natural History Partner for "Backcountry"
Cleveland Cinemas and the Cleveland Museum of Natural History have partnered to bring entertainment and education together in a new, on-going series that will take place at various Cleveland Cinemas locations. The first film to be announced is BACKCOUNTRY which will have a special screening on Thursday, April 2nd at 7:15 in advance of the film’s opening on Friday, April 3rd at the Capitol Theatre (1390 W. 65th St., Cleveland). The screening on April 2nd will include an introduction and post-film discussion hosted by Harvey Webster, Director of Wildlife Resources at the Cleveland Museum of Natural History. BACKCOUNTRY is based on the true story of a couple whose would-be romantic camping trip turned into a nightmare. 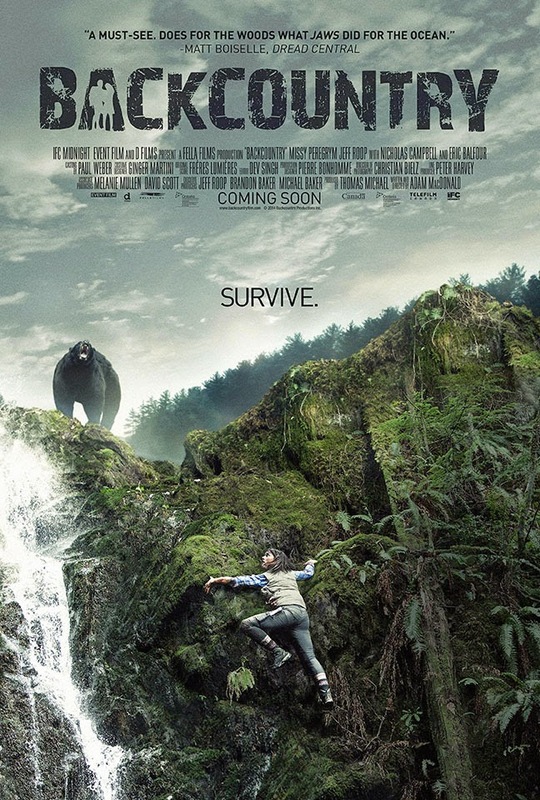 After losing their way in the woods, they find themselves in the midst of a bear’s territory and must do what it takes to survive under terrifying circumstances. Other films that will be showcased in this new series will include JURASSIC PARK and BALTO. Dates and details on these screenings will be announced soon. Tickets for BACKCOUNTRY are $9 for adults and $6 for seniors. The film is rated R and is not recommended for small children. Tickets can be purchased at the theatre box office or online at clevelandcinemas.com. A portion of each admission from the screening on April 2nd will be donated to the Cleveland Museum of Natural History. Harvey B. Webster is Director of Wildlife Resources at The Cleveland Museum of Natural History. He directs the Ralph Perkins Wildlife Center and Woods Garden and the Museum’s Wildlife Resource Center. The Perkins Wildlife Center is one of the largest zoos of native wildlife in Ohio. It is a unique, living, outdoor gallery at the Museum that promotes the awareness, appreciation and conservation of Ohio’s wildlife and the living communities upon which wild creatures depend. It is a perennial favorite of visitors to the Museum. Conservation and sustainability education is at the heart of the Wildlife Resource Center’s programs and the live animals at the Museum form a hard-working educational corps that reaches upwards of 250,000 people per year in exhibits, classes and programs.